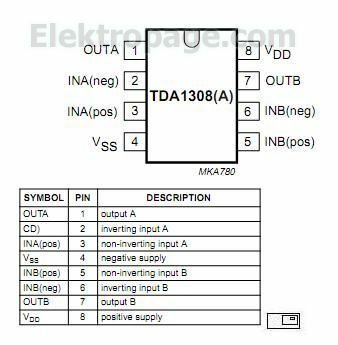 TDA1308; TDA1308A Class AB stereo headphone driver. The TDA1308; TDA1308A is an integrated class AB stereo headphone driver contained in an SO8, DIP8 or a TSSOP8 plastic package. The device is fabricated in a 1 mmCMOS process and has been primarily developed for portable digital audio applications. 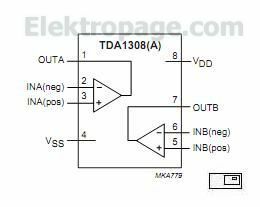 The difference between the TDA1308 and the TDA1308A is that the TDA1308A can be used at low supply voltages.